The i700plus is an integrated digital wireless phone for the mobile worker. Available in yellow or black with rubber grips, this phone combines the capabilities of a digital wireless phone, a two-way radio and a text pager. It supports Internet access with its built-in microbrowser, as well as two-way e-mail and wireless modem functionality. 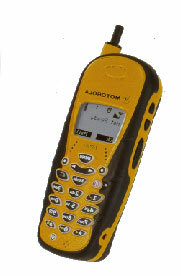 Designed to withstand elements such as shock and vibration, this phone can function as a wireless modem for notebook computer or personal digital assistant.